With optical discs becoming somewhat dated, it's become popular to mount ISO and other CD/DVD images as virtual drives. gBurner allows you to do that while also supported HD-DVD and Blu-ray formats. After installation of gBurner Virtual Drive has been installed, you can quickly mount various types of optical disc images as virtual drives (up to 16). It supports all of the most popular image files such as ISO, NRG, DAA, BIN/CUE, LCD, PXI and Apple's DMG. Version 4.8 is a freeware program which does not have restrictions and it's free so it doesn't cost anything. 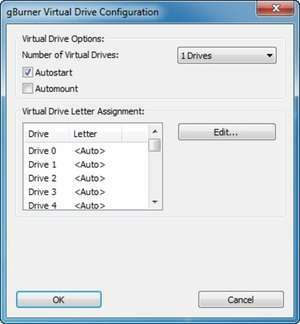 For security reasons, you should also check out the gBurner Virtual Drive download at LO4D.com which includes virus and malware tests. Additional screenshots of this application download may be available, too.